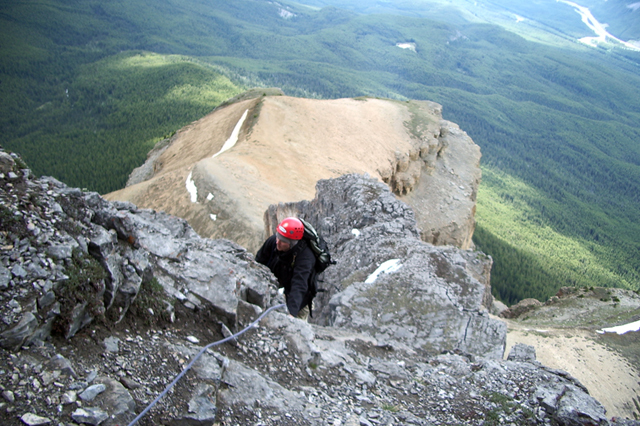 Castle Mountain in Banff boasts one of the best alpine-style rock climbing routes in the Canadian Rockies. 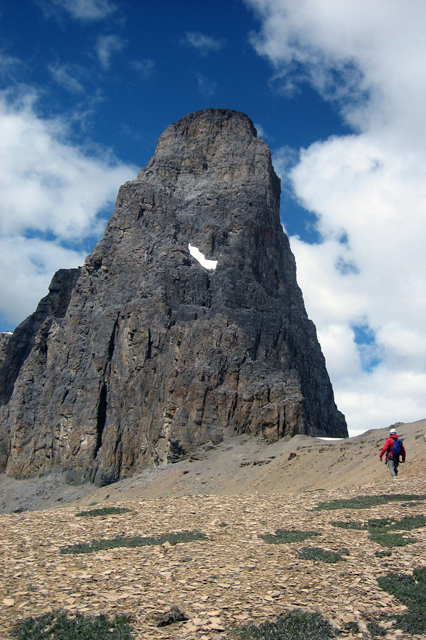 Its towers are easily viewed from Castle Junction on the Trans Canada Highway west of Banff, and make obvious climbing objectives. 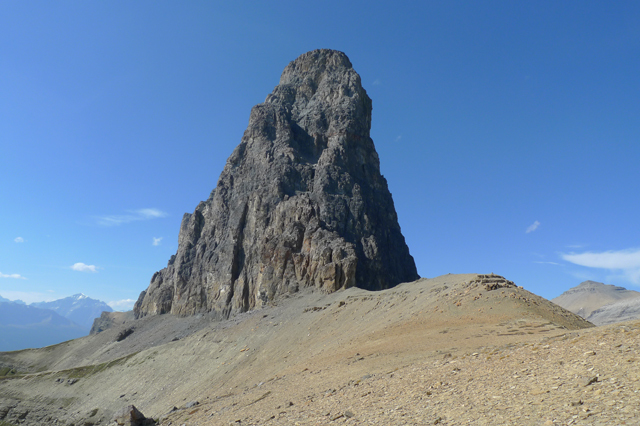 Individually, these routes can be completed in a day by very fit guests but also make for an excellent two-day experience by spending the night at the Castle Mountain bivi hut. 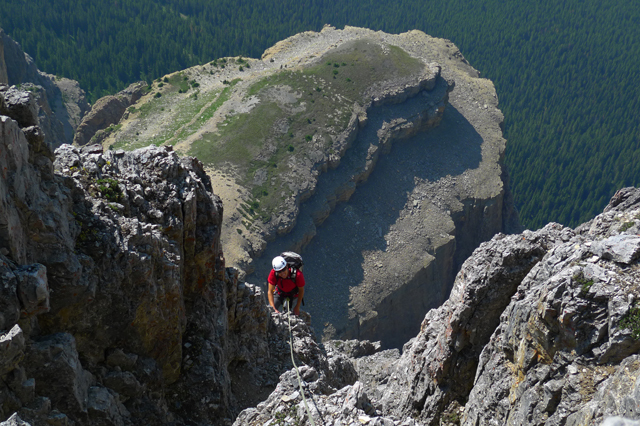 At Castle Mountain’s south eastern end stands Eisenhower Tower. 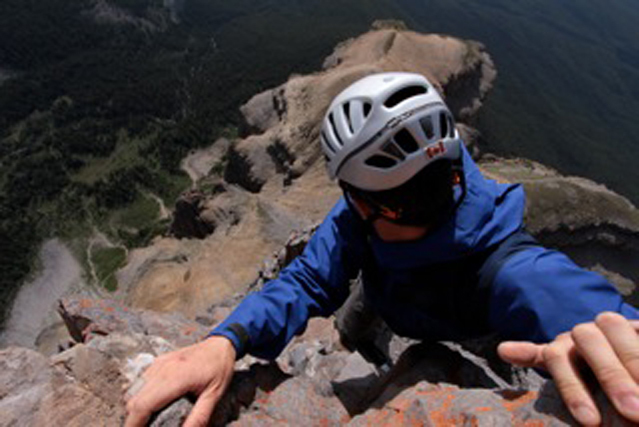 It is the perfect objective for the climber looking to build multi-pitch alpine rock climbing experience or just climb an aesthetic multi-pitch rock route. 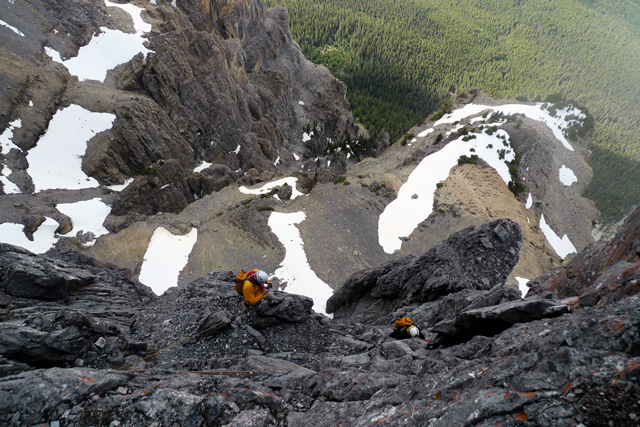 Excellent views, great climbing and a technical descent sum up an ascent of Eisenhower Tower. 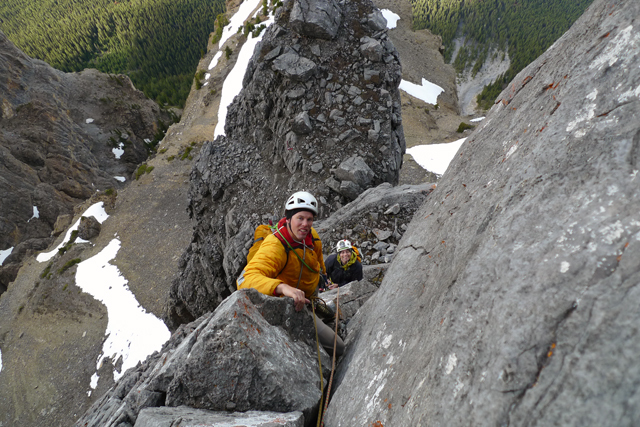 Many guests have experienced their first multi-pitch alpine rock route with us on this climb. 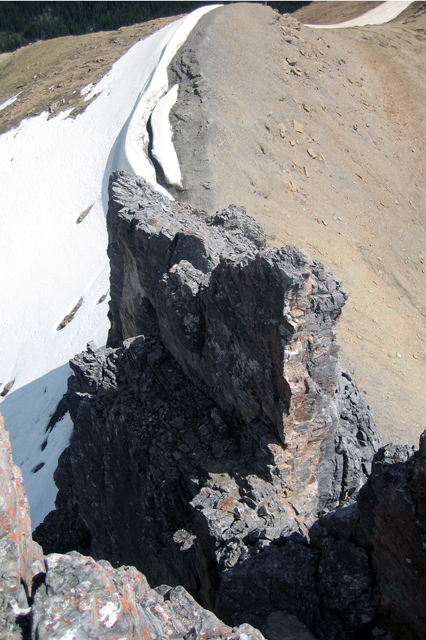 Experienced climbers will enjoy the beauty and variety of the route. 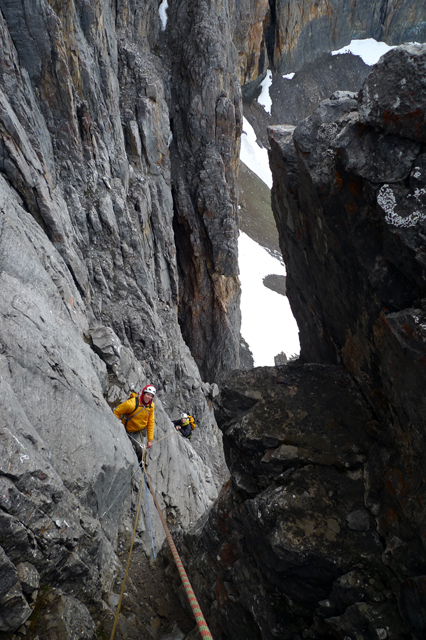 Slightly harder and more sustained than it’s neighbour Eisenhower Tower, Brewer Butress climbs a proud line up a beautiful buttress capped by a large roof. 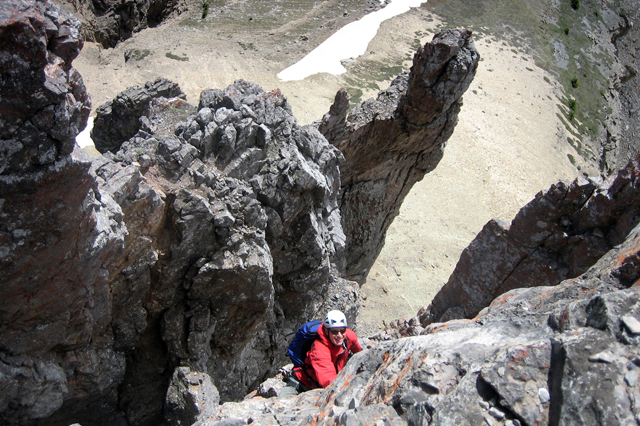 The route is exposed and is an excellent choice for climbers looking for a high quality, long multi-pitch alpine rock route. Brewer Buttress can be completed in one day by guests with excellent fitness, or comfortably in 2 days with guests with good fitness using the Castle Mountain bivi hut for an overnight. 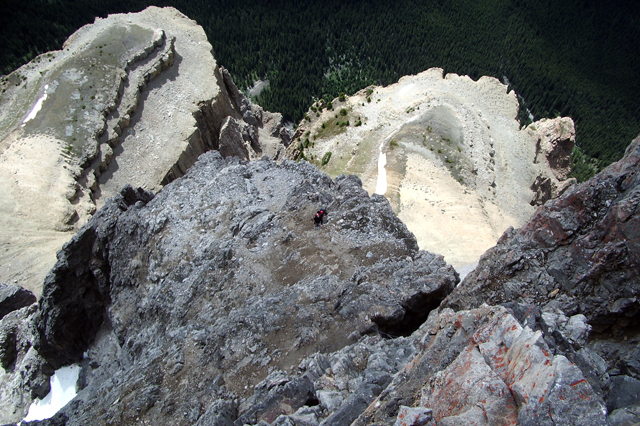 If you have never spent a night at the Castle Mountain bivi hut, this in itself is an experience! Please contact the office to arrange your trip. Maximum guide to guest ratio is 1:2. 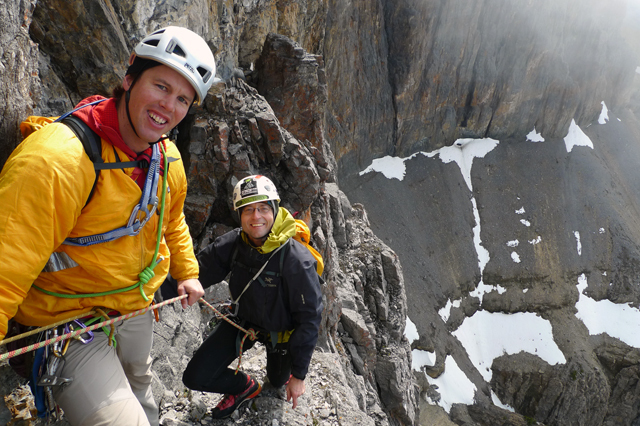 Our guides are enthusiastic and extremely talented. 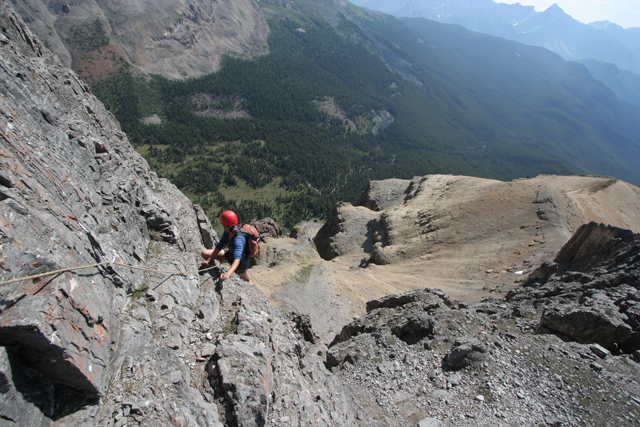 They hold certification from the Association of Canadian Mountain Guides and we are licensed to operate in the area by the Parks Canada. Maximum group size is 4, minimum 2. Accommodations and meals are not included for the 1-day trip. For the 2-day trip hut accommodations are included at the Castle Mountain Hut as are meals from lunch on day 1 to lunch on day 2. Accommodation in Canmore is not included. A variety of accommodation options exist in both Canmore and Banff, including campsites, hostels, all levels of hotels as well as condo style accommodation with kitchens or suites. We recommend that you book your accommodations well in advance as all levels of accommodations in the Bow Valley fill quickly. 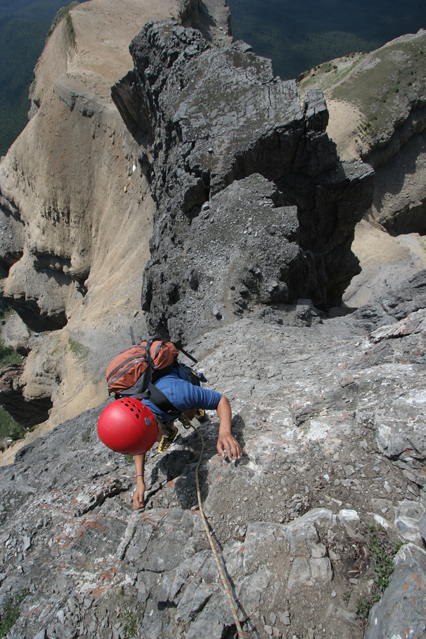 We supply group climbing gear such as ropes and hardware but we recommend that you bring your own personal climbing gear (e.g. harness and helmet), clothing and general equipment. We can lend you some personal items should you require. A rental charge will apply for rock shoes. Let us know, in advance, what you will need. 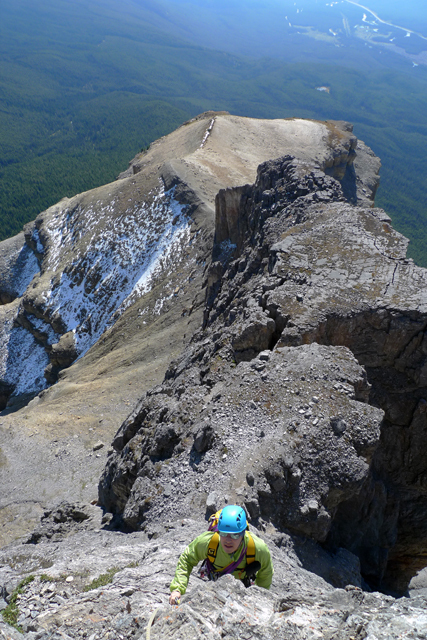 It is required that you bring rock shoes in addition to mountaineering boots for this program. Lightweight mountaineering boots – Or sturdy approach shoes. Ideally mountain boots should be lightweight leather or synthetic with a semi-rigid sole. 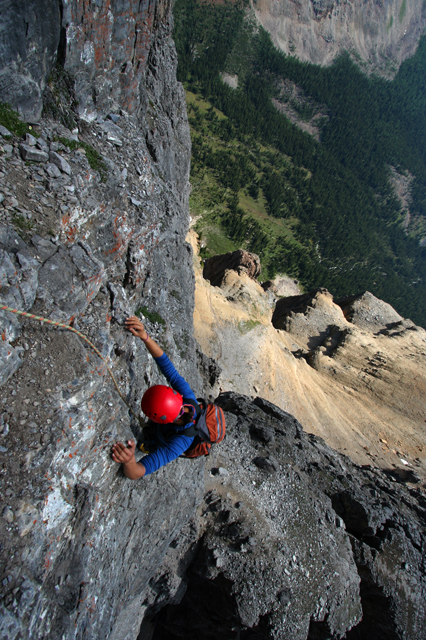 It is possible to buy boots such as the La Sportiva ‘Trango’ which are designed specifically for alpine rock. A sturdy pair of approach shoes would also be appropriate for this trip. 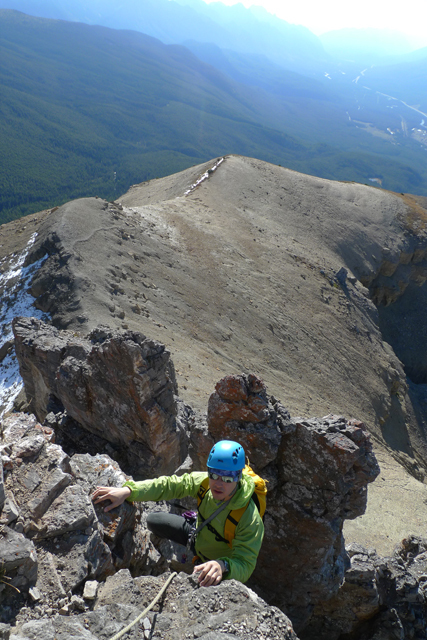 As always, the most important feature of a mountaineering boot or approach shoe is comfort. Different brands seem to suit different feet. If buying try a few different pairs and if they are not comfortable don’t buy them. There are many good brands. They include Asolo, Kayland, La Sportiva and Scarpa and 5.10. Daypack – Big enough to fit extra clothing, equipment and your food. A 30-35 liter capacity is suitable. We supply the following items, but if you have your own, please feel free to bring them: nut tool, belay device with pear shaped carabiner, 1 x 5m 7mm prussik, 1 x 120cm sewn sling and 2 x locking biners. For guests taking part in the 2-day program please ensure that you bring along a 3-season (0 to -5 Celsius) sleeping bag as well as a small toiletries kit. Please book as early as practical to avoid disappointment. We require full payment on booking. We accept Visa, Mastercard, Caertified Cheques, Electronic Transfers and Bank Drafts. Credit card payments are easiest, especially for international travellers. 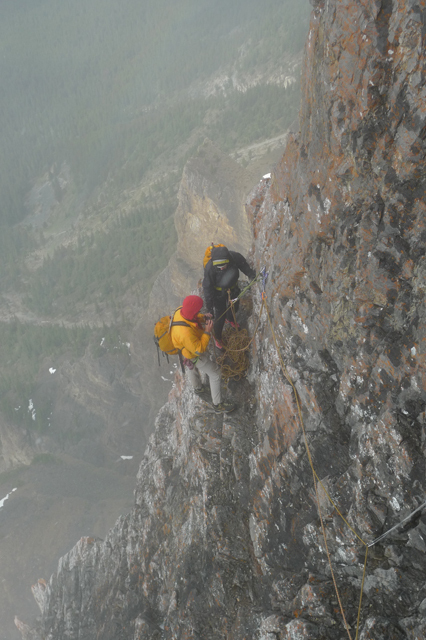 Guests signing up for this trip must be able to second numerous pitches of 5.6 – 5.7 rock and have previous experience seconding multi-pitch traditional rock routes.